5.40 points at 10 votes (rank 738). 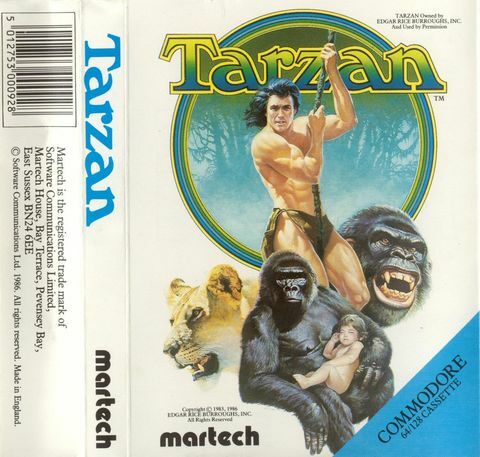 You are Tarzan and you have to pick up Jane! But you have to run a loooong way to get her, through the jungle, dark caves and sinister villages. And as many women do, Jane loves useless gadgets and shiny jewelry. That stuff is scattered across the game and you have to pick it all up, otherwise Jane won't show up. Jane is taken prisoner by Usanga, chief of the Wamabo tribe, because their 7 gemstones (called The Eyes of the Rainbow) have been stolen. 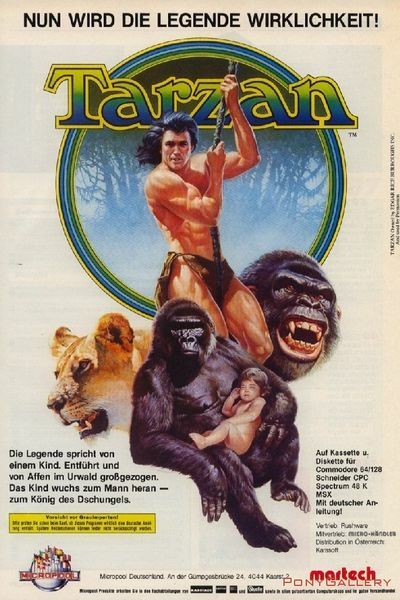 Tarzan needs to find and return them within 3 days, otherwise Jane will be sacrificed. Repetitive use of the background images is boring. Those backgrounds have tiny differences so it's very difficult not to get lost. However, because of this it is a great experience to stumble into another scenery after a long, long walk! Some graphics seem to have not been created well. Like the skull shaped rock scenery and the temple floor. Very sloppy. Music and sound effects are great though, and possibly the only reason to play this game when you don't like labyrinths and mazes. The 7 gem stones you have to pick up are hidden in the boxes, scattered throughout the game. Find them all. Otherwise you won't be able to rescue Jane. You will find several objects which you can use in the game, which also are hidden in the boxes. 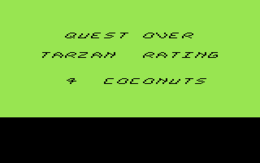 Some objects will be used automatically by Tarzan, others are said to be used by dropping them again. To use the rope to cross the wide swamp, just jump towards it when it's near you. 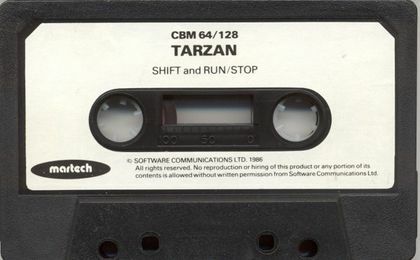 Tarzan will grab it automatically. In some screens the jungle scenery changes when you enter the screen for the second time. Just keep you eye on the passages and things will work out fine. It appears that when you punch a native so hard he will disappear off screen, he won't attack you again. Pick up all the boxes with stuff, but not the snake! It will drain your energy fast. You have 3 days to finish the quest. Each day has 4 parts, indicated by 4 colors. Green for day, light blue for twilight, dark blue for night and purple for dawn. When you're out of energy, 1 day will pass. Thus you can loose your energy only twice. At night, you cannot enter the skull shaped rock! Wait for dawn (purple sky). When the 4th day begins, the game's over. First concentrate on finding the rope and the torch, which are absolutely necessary in your quest. Then pick up all other stuff except the snake and rescue Jane! Use the map below. Versions with trainers are in the CSDb. reijkman: "Although the game is boring as hell, I felt an uncontrolable urge to finish it, mainly because of the music and sound effects. At first I drew a map on a piece of paper. 20 years later I composed one with Photoshop, after which I was able to finish the game... at last!! As with many of those games, the ending was very disappointing." 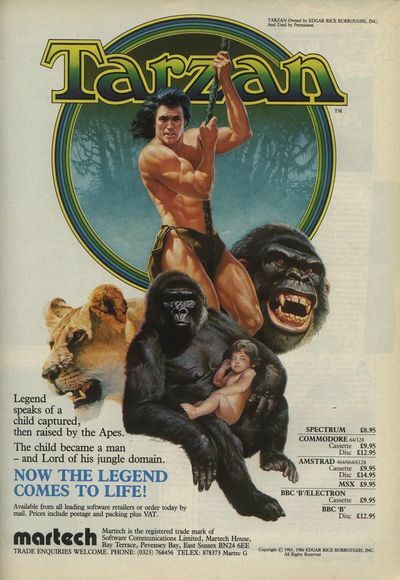 This page was last modified on 3 April 2019, at 00:32.